Alright, Hyundai. 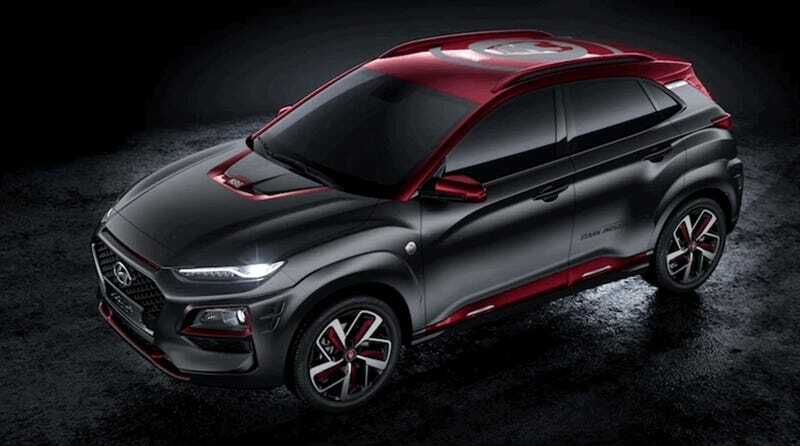 We need to talk about this “Iron Man Edition” of the Kona crossover real quick. First, Iron Man wouldn’t let one of his farts be transported five feet in a budget crossover with well under 200 horsepower, let alone put his face all over one. Second, refer back to the first point. It’s convincing enough. The worst part about this car is that it’s not just some marketing stunt that showed up at the San Diego Comic-Con this week to make us roll our eyes and sigh for the duration of its display there, like Nissan’s weird Star Wars thing. This Kona is a marketing stunt that Hyundai actually plans to sell, further highlighting the sad state of the human condition and the cars we drive. 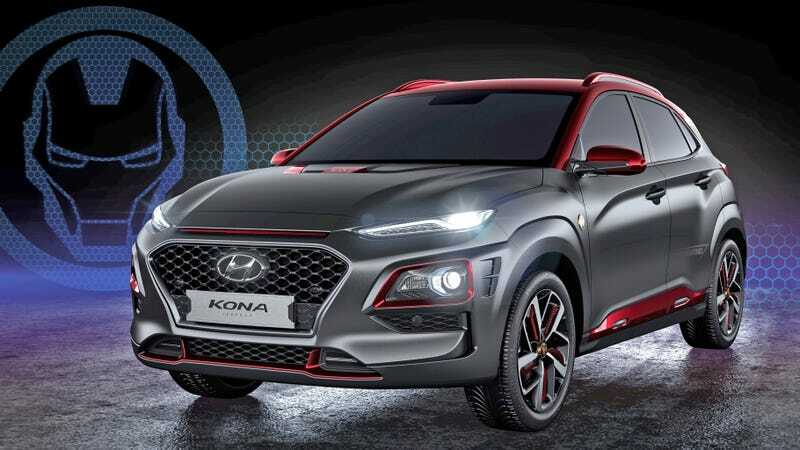 Hyundai announced that the car will go into production in December and be sold starting in 2019, but didn’t say what kind of specs it would have. The cheapest end of the regular 2018 Kona comes with a six-speed automatic and a 147-HP four-cylinder engine, while the most expensive end comes with a seven-speed automatic and a 175-HP turbo four. Every trim comes standard with front-wheel drive, the obvious option for Iron Man himself, who would never pass up a common crossover for something like an Audi R8, Acura NSX, Saleen S7, Tesla Roadster, 1967 Shelby Cobra or 1932 Ford Flathead Roaster. Iron Man had also, as of 2013, destroyed a theoretical $5.9 million in cars during the movies. A $30,000 crossover is perfect for him. Can you just imagine rolling up to the club (or the grocery store) with Iron Man decals all over your Hyundai crossover? You’d basically be Iron Man. There’s the inside, with a dash display that looks like it lights up with the eyes on Iron Man’s suit whenever you start the car. Every time you check your speed or revs, too, you can remember that weird arc reactor Iron Man put in his chest that almost killed him.... however many times it almost killed him. Look, anothe—nope, those are just the emergency flashers. Emergency! Tony Stark and all 175-ish horsepower in the crossover with his face all over it may destroy your car! Then there’s this stuff where the heads-up display should go, probably to make the driver feel super high tech and cool and Iron Man-like. If that’s not enough for you, the Iron Man edition of the Kona comes with the signature of the elusive fictional character Stark on the dashboard, which will surely up its resale price as a rare collectible. Everybody loves a famous person’s autograph, right? The only mystery left here is how Stark could have possibly signed the vehicle, considering a couple of things: One, he doesn’t exist, and two, he’d probably rather die of poisoning from some piece of metal in his chest than step foot in a common person’s crossover.